Japanese trends have moved beyond cat cafés and bunny cafés to eateries featuring live owls. Owl cafés and teahouses have sprung up in both Tokyo and Osaka. 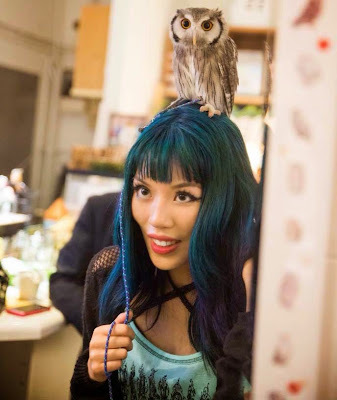 Blogger La Carmina visited the Fukuro no Mise ("Owl Shop"), where staff assisted in placing an owl on her head (IMAGE ABOVE, MORE HERE) as she sipped coffee. She describes, "All the birds are tame, and have a leg attached to the perch by string. I had an hour to enjoy their company and sip a drink that is included with the cover charge. The café doesn’t serve food, so I didn’t have to worry about beaks pecking at my plate."